Prof. Scott Baker established the NZCeTA in 1991. In collaboration with the Department of Conservation, Anton van Helden at The Museum of New Zealand: Te Papa Tongarewa and iwi the archive now holds over 2,000 tissue samples from 35 different cetacean species found in NZ waters. This archive exists due to the public reporting stranded animals, the generosity of DOC staff taking their time to collect the samples and local Māori allowing us to collect a piece of their tāonga. Thanks to the NZCeTA we were able to confirm the first ever sighting of the spade-toothed beaked whale from Opape, Bay of Plenty in December 2010 (Thompson et al. 2012 Current Biology). This generated enormous international interest and extensive media coverage. 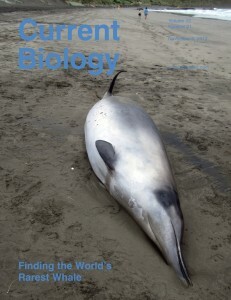 Kirsten Thompson recently published an excellent summary of the NZCeTA showing its value in understanding the biology of the difficult to study species, the ziphiids (beaked whales). This was part of Kirsten’s MSc research and you can see the full reference on our publications page (Thompson et al. 2013).